This is where I post about music: concert reviews, album reviews, and anything where I feel I have something to say. There are a few things worth noting. One is that I embarked on a project to write about this history and music of Mott the Hoople and Ian Hunter. You can find an index to this work on a separate page here; it is also referenced in a post below. 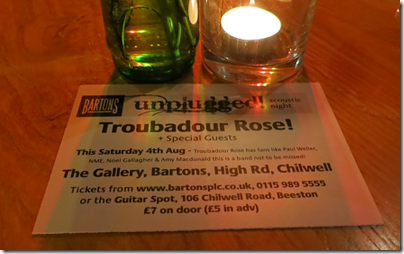 Last night I wandered over to Bartons in Nottingham, a newish venue in a converted bus garage – doesn’t sound promising, but it is fantastic, especially when tastefully set out with tables, candles and roses as it was last night for the second of its monthly unplugged events. 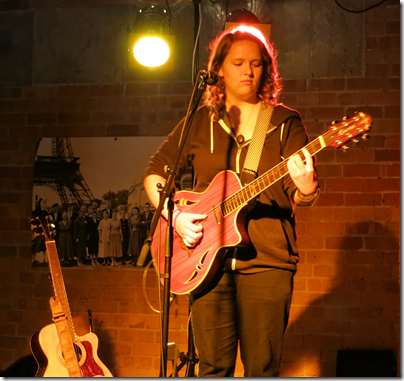 The musicians were local singer and guitarist Emma Bladon Jones along with the London folk band Troubadour Rose. 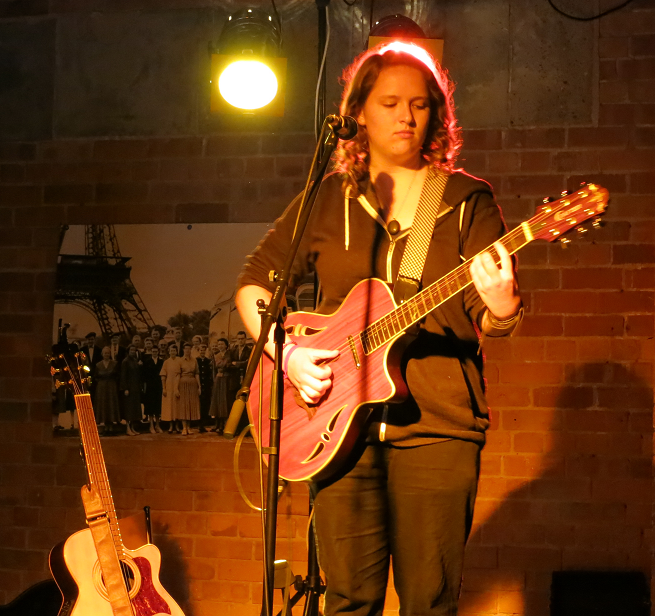 Bladon Jones was on first and treated us to an excellent set with her clear voice, sensitive songs and inventive guitar work. She played songs from her EP Life is Self Taught, a tender cover of In My Life by the Beatles, and a new song called Iris of War. It all went over well with me. She has a gadget called a loop box which lets her play a few bars and have them repeat live so she can accompany herself; seems risky but worked really well, and those moments where she experimented a bit with the sounds she could get from her guitar were highlights. 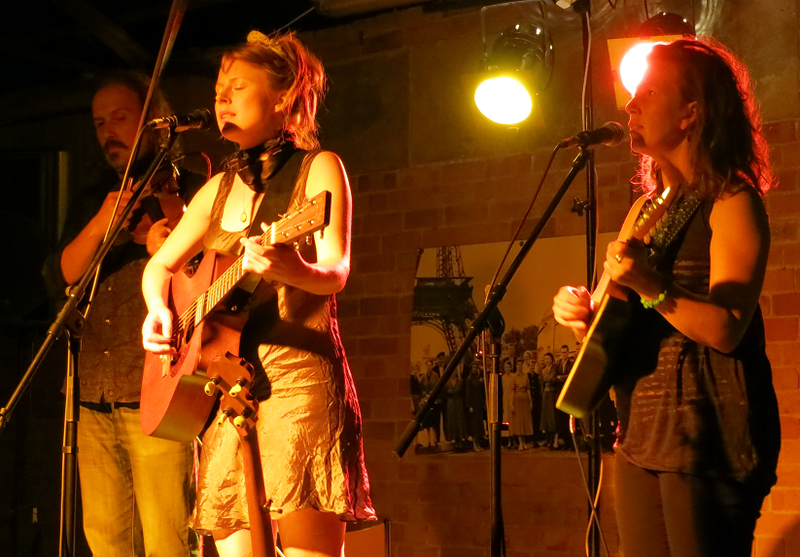 Next up was Troubadour Rose: Bryony Afferson (guitar and lead vocals), Lizzy O’Connor (banjo, mandolin and vocals) (and Gary Bridgewood (violin). 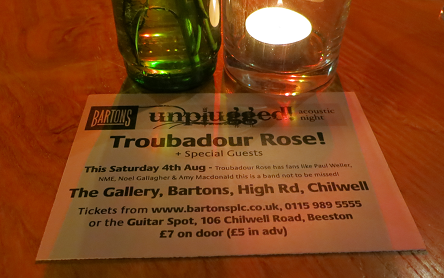 Apparently the band used to be called something else, but came up with a song called Troubadour Rose (which they performed last night) and liked it well enough to rename themselves accordingly. 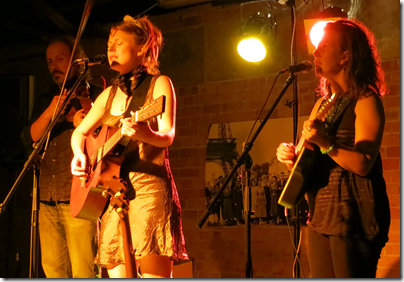 It is a great song, starting quietly and gathering pace, full of melody and drama, driven by Afferson’s expressive vocals, O’Connor’s sweet harmonies, and Bridgewood’s at times frenetic fiddle. Other highlights included the two songs from the band’s single, Labour of Love and Find and Arrow, which you can hear on Spotify or iTunes. A great evening and a shame rather few people turned out to enjoy it; but a treat for those us who discovered it.